What if Beck and Weezer released new albums and nobody cared? Weezer (Photo: Mark Horton/WireImage/Getty Images) and Beck (Photo: Phil Bourne/Redferns/Getty Images). October saw the release of Beck’s Colors and Weezer’s Pacific Daydream within weeks of each other—albums from two veteran artists that plenty of people bought or streamed, plenty of critics reviewed, but were, nevertheless, greeted with relatively muted fanfare. 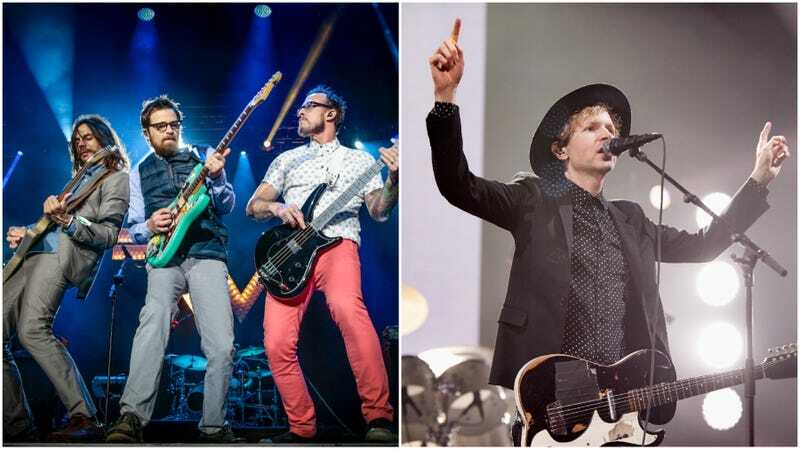 This was a marked drop-off even from their previous albums, which saw Weezer being credited with a return to form and Beck taking home the Grammy for Album Of The Year. Maybe it was just a case of bad timing; after all, both albums have distinctly summery vibes, despite arriving in October. But the more commonly accepted narrative is that these are two legacy acts trying to replicate past formulas—and both Colors and Pacific Daydream grapple with the weight of nostalgia directly. As it turns out, part of what’s compelling about them is how they fail to recapture the greatness of their predecessors. Beck and Weezer have been dealing with that burden for decades, having both made a splash with Geffen albums in 1994. Since then, they’ve both remained relatively prolific, alternating periods where they release an album annually with lengthy, three-to-four-year breaks. And all the while, they’ve struggled to top those early career breakouts—Weezer’s one-two punch of power pop and proto-emo, the self-titled “Blue Album” and its (eventually) cultishly adored follow-up Pinkerton (1996); Beck’s genre-bending Mellow Gold and Odelay (also 1996). Although Beck has maintained his critical acclaim, largely thanks to his sparer, folkier, more “serious” albums, Weezer’s output has proved more erratic, though it’s not without its own post-millennial highs. In 2017, both acts are, to some extent, throwing back to their past work. Colors marks the return of “Party Beck,” who appears most forcefully on 1999’s Midnite Vultures, but also factors into Mellow Gold, Odelay, and Guero, among others. The songs on Colors are brighter and dancier than anything Beck has put out in years, and far easier to picture wafting from a car stereo tuned to a terrestrial radio station (if terrestrial radio stations still wafted from many cars, or played much Beck). Similarly, Pacific Daydream touches upon multiple previous Weezer albums in an overall mode that will be familiar to longtime listeners. The muscular power-pop of opener “Mexican Fender” and the humming vocal melody of “Weekend Woman” recall the guitar-driven catchiness of the Blue Album, while the whole California-themed project is practically a sequel to last year’s White Album. Granted, it would be difficult to argue that Pacific Daydream is as good as the White Album—let alone Weezer’s classic debut—just as it’s hard to picture anyone arguing vehemently for the superiority of Colors over Mellow, Odelay, Midnite, or even Guero. But there are moments where each album reaches unmistakably for feelings that Beck and Weezer’s work has evoked in the past. In these, the gulfs that occur when they can’t quite grasp them are fascinatingly revealing. Pacific Daydream’s “Happy Hour,” for example, finds its narrator in desperate need of an after-work round at the bar, an anthem of everyday escape similar to the Blue Album’s “In The Garage.” But that song—along with having a much stronger melody—had way less baggage. It was far easier to buy the 1994 Rivers Cuomo as a KISS-listening Dungeons & Dragons nerd than it is to buy 2017’s Cuomo as a workaday wage slave. “Happy Hour” doesn’t evoke the desperate desire for a “happy hour on sad days” so much as Cuomo’s need for a good crowd sing-along in his set list. Beck has been even more direct about wanting Colors to be the kind of good-time music that’s fun to play live, and its dance-friendly beats and occasional falsettos definitely recall a slightly more straightforward Midnite Vultures in that regard. But unlike that freak flag of an album, Colors’ jams are so light and relatively unadorned that they’re downright vaporous, floating past without ever putting their hooks in for good. And by reuniting with Greg Kurstin—who’s since become an Adele- and Kelly Clarkson-collaborating Top 40 machine—it seems here like Beck is just following pop trends, rather than radically reinterpreting them. Isn’t the “whoa-uh-oh” refrain of “Dreams” just Beck’s version of the so-called “millennial whoop”? What is “Up All Night” if not Beck’s rendition of the we’ll-live-forever-because-we’re-young-and-drunk anthem popularized by the likes of Miley Cyrus, Fun, Pink, Kesha, et al.? In general, Cuomo has also been pretty forthcoming about his interest in contemporary pop, copping in recent interviews to studying top-hits playlists on Spotify and trying to decode their popularity. He may not be specifically writing to those trends, but there are moments when they definitely make themselves known: “Can’t Stop Partying,” from 2009’s Raditude, is in the spirit of those aforementioned bangers, while Pacific Daydream’s “Feels Like Summer” sounds like nothing else but an attempt to reproduce the pseudo-rock bombast of Imagine Dragons. Its electronic beats, canned “na-na-na-na-nas”, and earworm chorus (actually more of a drawn-out phrase) all slot easily into what, a few years ago, we might have called Best Buy Rock. In light of this contemporary-mindedness, each artist’s nods—and tweaks—to their past discography come off like deliberate subversion. Pacific Daydream’s “Beach Boys” homage, for example, should have been an easy layup for Weezer, an outfit that’s already slavishly adapted that band’s melodies and sentiments into its alt-rock crunch. Yet its echoing, semi-processed sound creates a gap between the song’s subject and style that actually makes it more interesting. (“Get Right,” a lower-key track, treads much closer to the Beach Boys than anything in “Beach Boys.”) Throughout Pacific Daydream, Weezer cooks up songs like this that revisit familiar territory, but sound more experimental than you’d expect. The result is an album that’s far more cohesive than the band’s scattershot efforts of 2008 through 2010, where instant classics like the “Red Album”’s “Pork And Beans” would give way to album back halves that inevitably collapsed. These unexpected turns dropped within their outwardly throwback-friendly records don’t make Colors or Pacific Daydream secret masterpieces, or even contenders for the artists’ best later-period work. But these two albums are examples of two artists nimbly dealing with—and openly confronting—the pitfalls of trying to square their legacies with competing in a much bigger, vastly altered pop landscape. Their respective attempts create a kind of intimacy that is unique to artists with long, sometimes uneven careers, and for that these albums are uniquely fascinating. If neither Beck nor Weezer seem especially “relevant” in 2017, well, the same goes for a lot of their fans. But these artists are still here, and their own contending with their continued existence has created a far more interesting narrative than perhaps even they would have expected all those years ago. “It’s a hip-hop world, and we’re the furniture,” Cuomo sings on “Beach Boys.” He doesn’t sound bitter about it.